While Dallas and Houston have long tended toward gowns and spangles, this intellectual hub -- home of the University of Texas, the state capital and some 700,000 people -- had a jeans and T-shirt reputation. But now, as new technology wealth comes to town and the local charity-gala circuit booms, Austin has become one of dozens of U.S. cities undergoing a fashion and luxury-goods makeover. This year, some 30 high-end retailers have opened boutiques in Austin, including Tiffany & Co., Michael Kors, Ralph Lauren, David Yurman, Louis Vuitton and Burberry. These names -- the vast majority represented in Austin for the first time -- are among the retail tenants of a $250 million shopping and residential complex, Domain, that Indianapolis-based developer Simon Property Group Inc. opened in March. Neiman Marcus, which has exclusive rights to sell Chanel and other labels here, is the anchor tenant. As America gets richer, more people outside the traditional fashion strongholds of New York and Los Angeles are lining up for designer labels and accessories. While the country's affluent have traditionally splurged on homes, cars or jets, only recently have wealthy Americans developed enough of a taste for pricey fashions to support a coast-to-coast industry. "We consider the U.S. the biggest emerging market for luxury goods," says Andrea Guerra, CEO of eyewear giant Luxottica Group SpA. This month, the company is launching a chain of boutiques in the U.S., Ilori, that will sell sunglasses from names including Chanel and Tiffany, for $250 to $10,000. New York's Fashion Week officially starts tomorrow, with the likes of Oscar de la Renta, Calvin Klein, Marc Jacobs and Donna Karan showing off their spring lines in big runway shows. The circuit continues internationally for the next few weeks, with runway presentations in London, Milan and Paris. In recent years, these shows have become the fashion world's answer to the Academy Awards, with days of footage broadcast to an increasingly mainstream audience. Now the looks are filtering throughout the U.S. Since 2006, French luxury giant LVMH Moët Hennessy Louis Vuitton SA has opened Louis Vuitton boutiques in Nashville, Tenn., Tucson, Ariz., and Austin, and says it plans to launch more than a dozen more this year in cities including Phoenix; Natick, Mass. ; and Jacksonville, Fla. Paris-based Hermès International SA opened a store earlier this year in Charlotte, N.C., and says it aims to double its U.S. sales in the next five years. Bulgari, the Italian jeweler that also sells $1,500 handbags and $550 sunglasses, says it plans to open 70 U.S. stores by the end of 2009, up from 16 currently. Its chief executive, Francesco Trapani, says he considers the U.S. one of the company's main growth targets, along with China. For luxury companies, such expansion carries risk. Many luxury-good marketers have already blanketed the big cities, so they have little choice but to seek growth in smaller markets. But by doing so, they may erode the impressions of exclusivity and scarcity that have been responsible for much of their allure. "The challenge for them is to control the distribution so that they always remain desirable," says Robert Burke, an independent luxury-goods consultant in New York. Some companies have been down this road before: In the 1980s, brands such as Pierre Cardin, Gucci and Christian Dior licensed their names widely for use on merchandise like umbrellas and luggage. Sales eventually tanked as upscale customers fled. Both Gucci and Dior eliminated licensing deals and spent much of the 1990s rebuilding their cachet. Austin typifies the newest preening of America. As high-tech jobs have brought in money and wealthy transplants from other parts of the U.S., the city's society scene has been supercharged. Where there were a few black-tie events each year in the 1990s, now there are scores. Earlier this decade, the city added a monthly society magazine, Brilliant, that document balls, fund-raisers and other society events with color photos. As Austinites pay more attention to what they wear for the cameras, retailers are paying more attention to Austinites. "Cities that come up on our radar have many black-tie events," says Karen Katz, president of Neiman Marcus Stores, a division of Neiman Marcus Group Inc.
Andrea McWilliams, 35 years old, is seeing people dress up like never before. For years, the Austin native and University of Texas graduate says the local style was "not glitzy." Fashion-minded Austinites shopped at By George, a boutique that carried some European and U.S. designers, and at Last Call, a Neiman Marcus outlet, where they bought marked-down designer labels. Ms. McWilliams says she did most of her shopping on business trips to Dallas. As the city's benefit circuit expanded, she says, local events began to take on a red-carpet feel. For the first time, she says, local reporters or photographers were asking attendees what they were wearing. "That got people thinking, 'Maybe I need to ratchet it up,' " she says. Ms. McWilliams, a lobbyist and Republican fund-raiser, says she's a fan of Escada, Chanel and Missoni. She has already started buying clothes for the Austin fund-raising season, which starts Thursday with a gala for Ballet Austin, where she says she'll wear a St. John gown she bought at Neiman's. She says she bought Oscar de la Renta and Badgley Mischka gowns there as well. Lance Avery Morgan, who founded Brilliant four years ago, estimates the city now has as many as 100 black-tie affairs between September and April. "Sometimes there are two big events occurring on the same night," he says. "That never used to happen." Austin's largest employers have long been the University of Texas and the state government. But starting in the 1980s, Austin also became headquarters for many high-tech companies. A University of Texas student named Michael Dell founded a computer business based in nearby Round Rock in 1984; Dell Inc. now employs 17,000 people locally. There are now 3,200 high-tech companies in the area, according to the Austin Chamber of Commerce, with Samsung, Hewlett-Packard and PayPal recently expanding or opening offices here. This part of Texas hill country is now dubbed Silicon Hills. Since 1980, the population of the metropolitan area has doubled to 1.5 million. 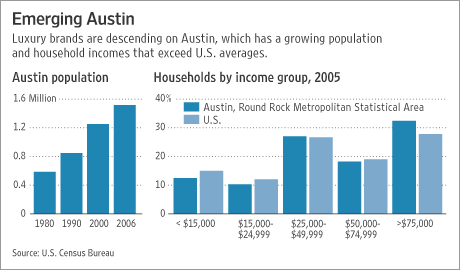 In 2005, Austin edged out Dallas and Houston as the richest city in Texas, with a median household income of more than $50,000, well above the national median of $46,500. A perennial front-runner on most-livable city lists, the area is also home to celebrities including athletes Lance Armstrong and Andy Roddick and actors Matthew McConaughey and Sandra Bullock. Carla McDonald, a former executive at a public-relations firm in New York, moved here with her husband, an investor, in 2001. "My life was in New York," says 42-year-old Ms. McDonald. "I came here kicking and screaming. Now I love it here and we would never leave." One of the first things she noticed, she says, was the money. But while some women were chicly turned out, she says, many weren't as "dressy and fashion-forward" as those in New York. There were few stores to choose from, she recalls, and many of Austin's boutiques catered to the university crowd. "You had to go out of town to shop for gowns," she says. Ms. McDonald, who runs a local marketing firm, says she began serving as a chairwoman for fund-raising events, and in the past two years, she says she's noticed a change. Transplants from New York, Los Angeles and Las Vegas have imported their sense of style. As women see more fashion on television and attend more social events, she says, many have refined their look. "Now that we have more options, it will make it easier," she says. Simon Property Group, which operates six other malls in the Austin metropolitan area, targeted this city for its Domain project for its wealth and high-fashion spending, says Richard Sokolov, Simon's chief operating officer. The city of Austin also granted tax incentives totaling about $37 million, including sales- and property-tax rebates, over 20 years. The open-air Domain complex, about a 20-minute drive from downtown, includes restaurants, 390 apartments -- rental units run from $920 to $2,244 -- and 75 shops in all, including a wing of 30 luxury brands. Simon is remaking some malls in other cities to incorporate luxury zones, as well. At its South Park Mall in Charlotte, it created a luxury wing by moving a Tiffany's store and adding new locations for Nordstrom, St. John, Louis Vuitton, Hermès and Burberry. Neiman Marcus signed on as Domain's anchor tenant in Austin after watching luxury sales take off in the area. Neiman's president, Ms. Katz, says the company had already seen Austin's Last Call outlet become one of its top performers nationwide. The retailer had also tracked local sales growth from ZIP codes at all of its branches and online, and discovered that Austinites were dependable consumers of cocktail dresses, gowns, fine jewelry, designer shoes and handbags. After 18 months of talks with local developers, Neiman agreed to build an 80,000-square-foot, two-floor store here, smaller than its 200,000-square-foot Dallas and Houston stores. Ms. Katz says the Austin branch is designed so that additional floors can be added. The store stocks brands including Thakoon, Derecuny, Dolce & Gabbana (whose leopard-print halter gown runs $1,400) and Lela Rose ($1,900 for a short halter dress). In Austin, many of those brands are exclusive to Neiman's. At Domain, Neiman's says that sales this year are ahead of projections, while Barneys Co-op says they are on target. Tiffany says it is exceeding expectations. The company declined to provide figures for the Austin store, but says sales have been strong across what it calls its secondary markets. With 65 U.S. boutiques currently, Tiffany says it has scouted up to 50 areas for possible new locations over the next five years, including St. Louis, Pittsburgh, Baltimore and Richmond, Va. Tiffany executive vice president Beth Canavan says the company's expansion plans are powered in part by a critical mass of well-paid working women who are buying jewelry for themselves. She adds that Tiffany's biggest growth area, in percentage terms, is diamond jewelry priced at $50,000 and up. Neiman's says spending has been driven by Austin's busy social calendar. Nancy Nichols, vice president and general manager of the Neiman's at Domain, says sales associates stay on top of parties in town to make sure their clients aren't wearing the same thing, a concern once more associated with White House balls and Academy Award parties. It's a different feeling from Dallas, Neiman's headquarters, where she worked for the company previously. "The women in Dallas shop for sport," says Ms. Nichols. "The Austin women like to shop right before events." The retailer has also been surprised to see spending trickle down to younger buyers, including women at the University of Texas. "Students are buying sophisticated cocktail dresses and gowns," Ms. Nichols said. All of this has spurred a backlash of sorts, as some local entrepreneurs pine for a return to the days when this liberal college town was referred to as the "blueberry in the tomato soup." This summer, a group of local businesses banded together to protest the tax incentives handed out to the new Domain complex. Similarly, a few years ago, a different group of small businesses began circulating "Keep Austin Weird" bumper stickers. At Neiman's charity gala last March, 1,100 well-dressed young partygoers danced to local bands until midnight. Neiman's slogan for the evening: "Keep Austin Fabulous."